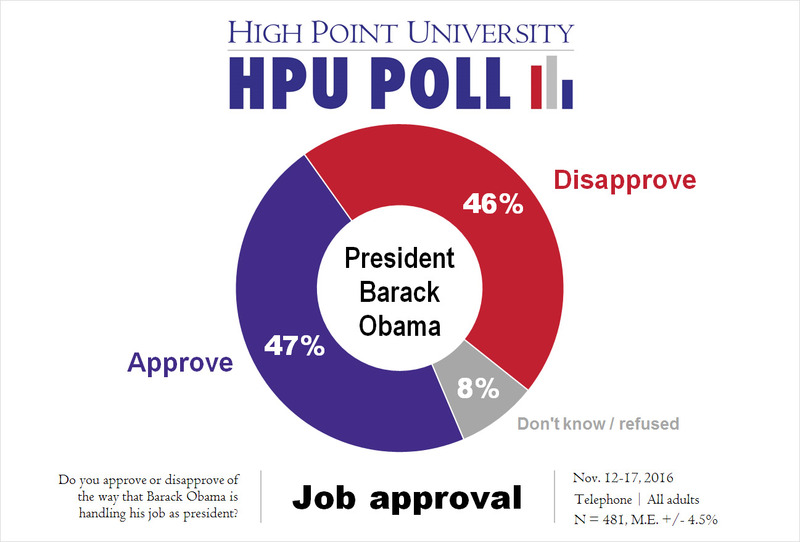 HIGH POINT, N.C., Nov. 21, 2016 – The HPU Poll’s post-election survey finds only one out of five North Carolinians believes the country is headed in the right direction, and just less than half of those same North Carolina residents approve of how President Barack Obama is doing his job. Continuing a pattern that has persisted for some time, just 19 percent of North Carolina residents said that the country was headed in the right direction, compared to 71 percent who said it was on the wrong track. This is directly comparable to the 70 percent of North Carolinians who said the same thing the last time the HPU Poll asked the question of the same population (all adults in North Carolina) in February 2016. North Carolinians continued to be deeply divided on Obama’s performance as president. Forty-seven percent of these North Carolina residents approved of his job performance, while 46 percent disapproved. In February 2016, 44 percent approved of President Obama’s performance in office. The poll also asked which issues North Carolinians thought were the most important problems facing the country. One in five (20 percent) of the respondents said that the economy was most important, followed by 18 percent who named education, 17 percent who said health care, and 16 percent who said government ineffectiveness. When asked about the most important problems facing the state of North Carolina, almost one third (32 percent) of these NC residents said education, followed by 13 percent who said the economy, 12 percent who said government ineffectiveness and 11 percent who said health care. Although national security was cited by only 11 percent of respondents as the most important national issue, a majority of North Carolina residents (53 percent) said the U.S. should take an active part in world affairs. More than four out of five (86 percent) of these same respondents said that the world is becoming more dangerous for the U.S. and the American people. Furthermore, although a majority of North Carolinians said that the ability of terrorists to launch a major attack on the U.S. is less and or the same as it was on Sept. 11, 2001, 40 percent said that terrorists now had a greater ability to launch such an attack. The poll also asked the respondents if they had voted in the 2016 elections. North Carolina residents who said they had voted in the elections were asked several questions about what they took into account when voting. Almost all voters (91 percent) had heard about Hillary Clinton’s email controversy, and about one-third of voters said that it had affected their vote a lot. About two-thirds (65 percent) said they had heard a lot about HB2 – the state law that requires transgender people to use the bathroom of the gender listed on their birth certificate and limits the types of anti-discrimination ordinances that local governments can pass. About half of voters (52 percent) said that their feelings about HB2 affected their votes for governor a lot. When asked about how much each of the issues presented in the most important problem list affected their votes, the highest percentages of voters said that health care (75 percent), the economy (74 percent), national security (69 percent), and government ineffectiveness (69 percent) had been very important to them in casting their vote for president. These same voters said that when voting for North Carolina Governor, the issues of education (72 percent), the economy (65 percent), and health care (60 percent) had been very important in their decision. Do you approve or disapprove of the way that Barack Obama is handling his job as president? Now I am going to read a list of possible problems facing this country today. Please wait for me to read the entire list, then tell me which ONE of these problems is the MOST important facing the country today. Now I am going to read a list of possible problems facing the state of North Carolina. Please wait for me to read the entire list, then tell me which ONE of these problems is the MOST important facing the state of North Carolina. Now we would like to ask you some questions about foreign affairs issues. Do you think it will be best for the future of the country if we take an active part in world affairs, or if we stay out of world affairs? Thinking about current U.S. relations with the rest of the world, would you say that the world is becoming safer or more dangerous for the U.S. and the American people? Overall, do you think the ability of terrorists to launch another major attack on the U.S. is greater, the same, or less than it was at the time of September 11th terrorist attacks? How much have you heard about emails from Hillary Clinton and her State Department and campaign staff that have been posted on the internet? Would you say you have heard a lot, a little bit, or not much at all? How much would you say that the issue of Hillary Clinton’s emails affected your vote for president? Would you say a lot, a little bit, or not much at all? There was a lot of attention in North Carolina’s elections to the law often called HB 2 that requires transgender people to use the bathroom of the gender listed on their birth certificate and limits the types of anti-discrimination ordinances that local governments can pass. How much did you hear during the election campaigns about HB 2? Would you say a lot, a little bit, or not much at all? How much would you say that your feelings about HB2 affected your vote for Governor of North Carolina? Note: For the reported effect of particular issues on vote for president and North Carolina Governor, see the full memo at http://www.highpoint.edu/src/files/2016/11/49memoA.pdf. 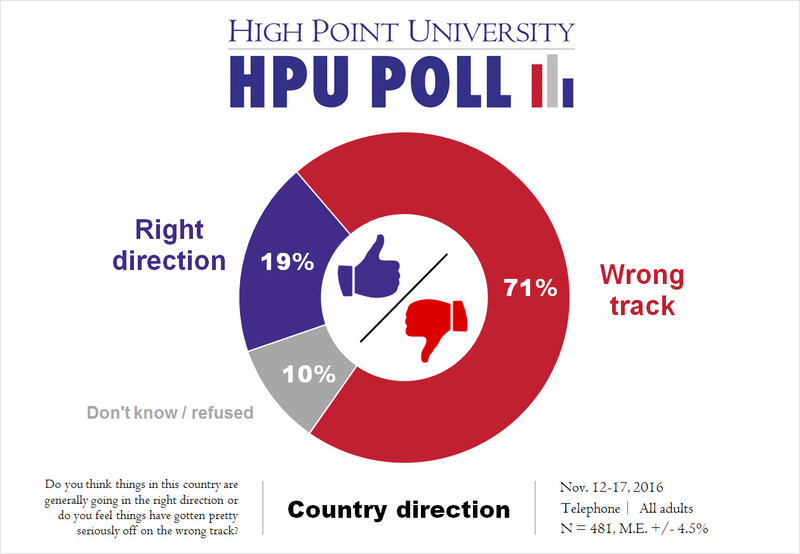 The most recent HPU Poll was fielded by live interviewers at the High Point University Survey Research Center calling on Nov. 12 – 17, 2016. The responses from a sample of all North Carolina counties came from 481 adults with landline or cellular telephones. The Survey Research Center contracted with Survey Sampling International to acquire this sample. 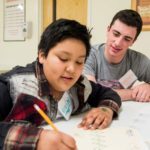 The survey has an estimated margin of sampling error of approximately 4.5 percentage points for all adult respondents. That margin of error is 4.8 percentage points for the sample of respondents who said they voted on November 8, 2016. The data is weighted toward population estimates for cellular and landline telephone use, age, gender and race. In addition to sampling error, factors such as question wording and other methodological choices in conducting survey research can introduce additional error into the findings of opinion polls. 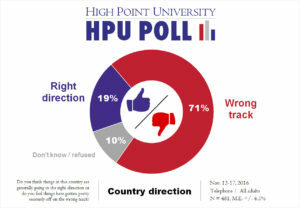 Details from this survey are available at http://www.highpoint.edu/src/files/2016/11/49memoA.pdf. Further results and methodological details from the most recent survey and past studies can be found at the Survey Research Center website at http://www.highpoint.edu/src. The materials online include past press releases as well as memos summarizing the findings (including approval ratings) for each poll since 2010. 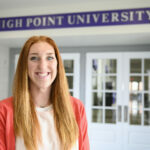 You can follow the HPU Poll on Twitter at https://twitter.com/HPUSurveyCenter. 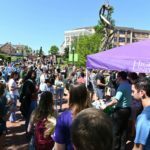 Dr. Martin Kifer, associate professor of political science, serves as the director of the HPU Poll, and Brian McDonald serves as the associate director of the HPU Poll.